Coal has long been the dominant source of electricity generation in the Mountain Census division. In the eight Mountain states, coal-fired power generation made up almost 50% of the region’s total generation in 2015, compared to the national average of 33%. A decade ago, coal’s share in Mountain states was even higher, at 63%. Since then, other electricity generation fuels, such as natural gas, renewables, and nuclear, have gained generation share. Low-cost coal from nearby coal deposits has supported coal-fired electricity generation in the Mountain region. 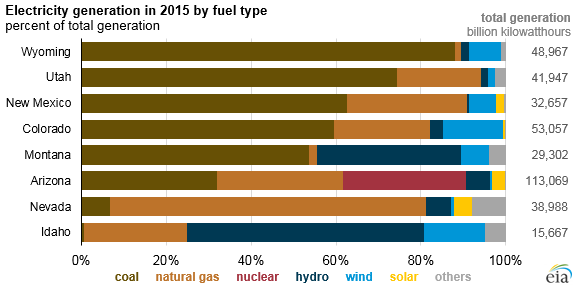 In 2015, Montana, Wyoming, Utah, Colorado, and New Mexico accounted for 79% of the region’s coal-fired electricity generation. The other states in the region—Arizona, Idaho, and Nevada—lack abundant coal resources. Instead, hydropower dominates electricity generation in Idaho, while natural gas plays a bigger role in Arizona and Nevada. In the past decade, the share of electricity generated from natural gas has increased in all Mountain states except Colorado. Natural gas accounted for 26% of the total electricity generation in the region in 2015, up from 19% in 2005. Arizona has the only nuclear plant in the region—Palo Verde—which, despite having a lower capacity than the Grand Coulee hydroelectric plant, generates more electricity than any other power plant in the United States. Palo Verde increased its generating capacity for two of its three units between 2006 and 2007 through uprates. Less downtime for maintenance has also improved Palo Verde’s operation and increased the plant’s average annual output. 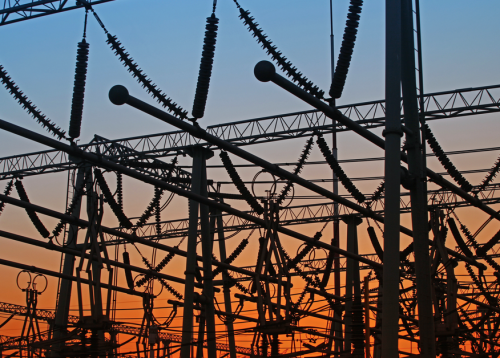 Palo Verde alone accounted for 9% of the region’s electricity generation in 2015. The share of renewables generation has increased in the region’s electricity generation mix in the past decade. Electricity generation from nonhydro renewables in Mountain states increased from 1% of the region’s generation in 2005 to 8% in 2015. Wind generation increases were mostly in Colorado and Wyoming, while solar generation growth was mostly in Arizona and Nevada. The rising use of nonhydro renewables in the region is partially attributable to individual states’ renewable portfolio standards. 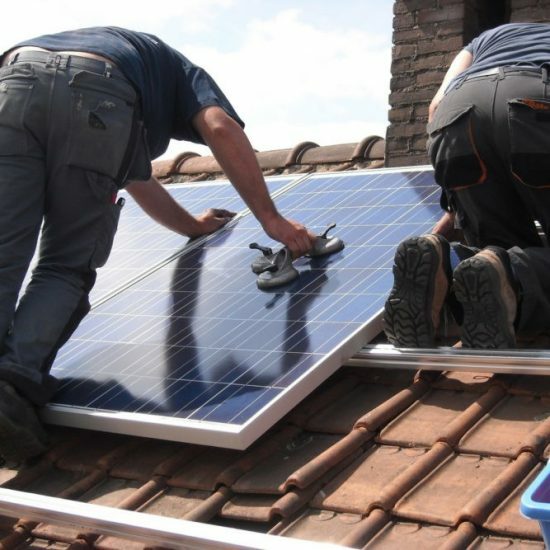 Currently, Montana, Colorado, Nevada, Arizona, and New Mexico have established renewable portfolio standards in their states, and Utah has a renewable goal. These six states installed a total of nearly 9 gigawatts (GW) of renewable generating capacity between 2005 and 2015. Although Idaho and Wyoming currently do not have renewable portfolio standards or renewable goals, they have collectively added more than 2 GW of capacity between 2005 and 2015. Many states export electricity to neighboring states because renewable energy certificates associated with renewable electricity generation can be sold to other states to fulfill their RPS requirements. According to EIA’s Annual Electric Generator database, nearly 7 GW of new generating capacity is expected to become operational in Mountain states by the end of 2018. 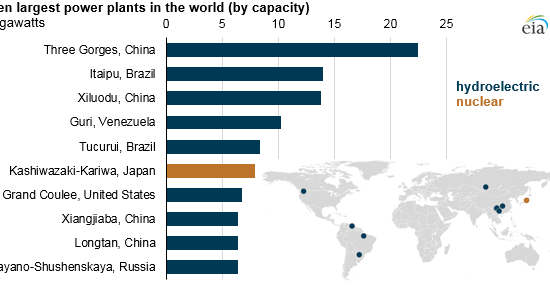 Nearly two-thirds of the planned additional capacity are new solar (2.5 GW) and wind (2.1 GW) plants. New Mexico has the most planned wind capacity additions (more than 1 GW), and Nevada has the most planned solar capacity additions (almost 1 GW).